While I lack hard figures, I strongly suspect the most popular use of an inflatable kayak is for use on lakes and other small bodies of water. Visit a popular lake near your house during nice weather and it’s almost a guarantee you’ll see plenty of these vessels floating about. And indeed, lake paddling with an inflatable kayak was my first use of this type of boat. For paddling on lakes, inflatable kayaks are a superb choice. They are lightweight, inflate fast, work fine for fishing, and are easy to climb into even while swimming in the water. In short, inflatable kayaks are just plain fun to use on lakes and ponds. Moreover, inflatable kayaks don’t require fancy auto roof racks or two strong backs to transport, like hard shell kayaks and canoes need for transport. For an inflatable kayak, just deflate it, roll it up and toss it in the trunk of your car or a forgotten nook or cranny of your RV. Done. The Sea Eagle FastTrack Inflatable Kayak. Ideal for long lake paddles. More information at Sea Eagle.Com. Oh, and other huge selling point that makes inflatable kayaks for lake paddling so popular. They are inexpensive, much less expensive than canoes or hard shell kayaks. Now, any inflatable kayak can be used to paddle across all but the largest lakes. However, very few kayaks are specifically designed for long, fast and efficient paddles across large bodies of flat water. The purpose of this article is to introduce readers to inflatable kayaks that are specifically designed to paddle across large bodies of flat water. And it’s meant for paddlers who plan to paddle across lakes and flatwater frequently. Moreover, this article focuses on only quality inflatable kayaks—or those types of kayaks that will not develop leaks and tears every other time they’re used and which won’t develop leaks during storage. The purpose of this article is to introduce readers to the types of inflatable kayaks that are specifically designed for quick and efficient paddles across lakes and other large bodies of flat water. Do You Really Need a Dedicated Lake Paddling Kayak? To clarify, for “lake paddling” in this article we’re not talking about paddling around your local lake on occasion for a few miles. Or even a periodic 5-mile jaunt across a larger lake for an overnight. For shorter, more infrequent paddles across lakes and other flatwater, while dedicated lake paddling kayaks are certainly nice to have since they are so efficient and easy to paddle, they are a bit overkill. For occasional lake paddle trips, a quality recreational level inflatable kayak, such as a Sea Eagle 370, work just fine. In other words, if you only on rare occasions plan to make five or so mile paddles on lakes or other bodies of flat water, you don’t really need a dedicated lake paddling inflatable kayak. A recreational kayak or expedition level inflatable kayak will work just fine, and also provide greater versatility for other activities. Instead, for purposes of this article we’re talking hard-core lake paddles. Paddlers who make frequent trips across large bodies of flat water, in a wide variety of weather conditions and need a boat that is fast and efficient to paddle. Paddlers who make frequent paddles of 5+ miles a day, often go over 10+ miles and occasionally push out to the 20-30 mile a day range. Or paddlers who plan to take multi-night trips into remote areas, paddling every day, while bring along lots of gear. These longer and/or frequent paddle trips are the true domain of dedicated lake and flatwater paddling inflatable kayaks. It’s where the key characteristics these boats are designed with really shine through and benefit the paddler immensely. No yaw – To counter-act yaw, quality lake paddling kayaks have a skeg, a keel, or better yet—both. The skeg/keel counteract the natural tendency of the boat to turn when the boat is paddled by a solo paddler. Don’t discount the importance of yaw, either. On long paddles across lakes, a boat that lacks the ability to counteract yaw is much more tiring to paddle. The kayak also travels much slower, since the boat is constantly veering off the right and then the left. Finally, the constant “yawing” of the boat adds considerable distance covered when you paddle. Straight lines are always faster than squiggly lines. Firmness – A firm inflatable kayak, all other things equal, passes through water much easier than one that is squishy. A “firm kayak” is one that is inflated to a high PSI, typically a minimum of 3 lb PSI. By contrast, most recreational level inflatable kayaks have an inflation pressure of just over 1 lb PSI. Low Profile – Anyone who’s been in a canoe on a windy lake fully understands how the wind affects handling, and not in a good way. Boats that have high sidewalls, particularly canoes, always wage a constant battle against the wind. As such, dedicated lake and flatwater inflatable kayaks have very low profiles. Unlike most standard recreational or expedition inflatable kayaks, these kayaks have much smaller diameter pontoons, which reduces the effect of wind on the boat’s performance. provide less surface area above the water, thus reducing wind effects on the boat. A typical pontoon diameter for lake paddling kayaks is less than 10 inches, compared to the 11-12 inch diameter found on recreational and expedition level inflatable kayaks. Do You Really Need a Dedicated Lake Paddling Inflatable Kayak? The biggest limitation of a dedicated lake or flatwater inflatable kayak is that they aren’t designed for serious whitewater or used in ocean waves. Why is that? The Sea Eagle 393 is a superb inflatable kayak for dedicated lake paddling. More info at Sea Eagle.Com. All lake paddling kayaks have low sidewalls. The low sidewalls make it easier for water to rush into the boat when running rapids. While this water won’t swamp the boat (provided the drain valves are open), the low sidewalls make running rapids more difficult than with other kayaks whose higher sidewalls and longer splash guards block much more water from entering the boat. Secondly, the skegs and keels found on lake and flatwater paddling kayaks—which make them so ideally suited for long paddles across lakes—become a liability in whitewater and heavy rapids where sharp, precise turns are required. When running whitewater, skegs and keels hinder the ability to make the needed tight, crisp turns to skirt obstacles or to thread through the big waves or holes often found in whitewater rapids. Third, the skegs and inflatable keels increase the water depth needed to avoid having the skeg or keel drag across the bottom. For lake paddling, this is rarely an issue since the skeg or keel only add about four inches to the “draw” of the kayak. However, for shallow waters, especially shallow, twisting flatwater rivers, the additional water depth needed for kayaks with inflatable keels poses problems (the skeg can be detached). Even deflated, inflatable keels require extra water depth to avoid dragging along the bottom. For very shallow waters found on twisty, narrow streams, a expedition level kayak is generally a better choice since it lacks a keel and the skeg is easily removable. My own 380x expedition level kayak only draws about 2-3 inches of water with me and lots of gear in the boat. Overall, if you foresee running strong rapids and whitewater, which is defined as Class III rapids or greater, than a dedicated lake and flatwater inflatable kayak isn’t for you. Similarly, if you want a boat to ride big ocean waves, these types of kayaks also aren’t for you. Finally, if you foresee spending lots of time on narrow, shallow flatwater rivers, kayaks that have inflatable keels (such as the RazorLite class) will pose problems. For such rivers, expedition level kayaks are generally a better choice. So do the limitations of lake and flatwater inflatable kayaks mean that these boats can’t be used on rivers? Absolutely not. In fact, these types of inflatable kayaks are frequently the best boat to use on rivers. Most rivers in the USA have few if any rapids. And for many rivers, a “rapids” may be nothing more than a bunch of riffles, eddies and the occasional wave that is easily bypassed. For these types of rivers, provided they aren’t too shallow, a lake and flatwater specialty inflatable kayak works just fine. Moreover, many rivers in the USA have very slow current, often bordering on “stagnant.” Floating these slow current and “stagnant” rivers is almost equivalent to “floating a lake.” That is, if you don’t paddle you’ll go nowhere on these types of rivers. For rivers that have slow or non-existent current and enough water depth to prevent dragging (about 6 inches), lake and flatwater inflatable kayaks are often the best type of inflatable kayak to use. So what are some of the ideal uses for inflatable kayaks that specialize in flat water/lake paddling? Here’s a partial list of great uses for these types of kayaks. It goes without saying that long, overnight paddling trips—such as through the Boundary Waters Canoe Area—are ideal for these types of inflatable kayaks. These kayaks will cut through water with ease, even on windy days. And their lightweight and portability makes them superb for portaging between lakes, or simply carrying back up the hill to your car. Moreover, the FastTrack series inflatable kayaks have a large gear capacity. This allows the boats to be taken on multi-night trips. And their tough hull design (made from the same fabric that expedition level kayaks are made from), greatly reduces the probability of having “boat problems” (aka….leaks or tears) while paddling and exploring a remote area. For anglers who need a portable inflatable kayak for fishing but lack, or simply don’t want, a motor, dedicated lake paddling kayaks are excellent choices. In particular, the Sea Eagle FastTrack series has many options to enhance comfort and productivity while fishing. And should the angler change their mind and eventually want a motor, it can be attached to the kayak by using a motormount. Individuals who don’t take overnight trips but enjoy long paddles on lakes and other bodies of flat water will also love these specialized lake paddling kayaks. While any kayak can be paddled a couple of miles, that changes considerably when a paddler needs to put 20 miles in a day behind them. Due to poor trip planning, I once had to paddle my expedition level inflatable kayak, a Sea Eagle 380x, twenty miles across perfectly flat water—and without a skeg. The experience was awful. By contrast, a lake kayak such as the FastTrack or RazorLite would have made the paddle much faster, significantly easier and, above all, far less frustrating. As mentioned earlier, dedicated lake and flatwater inflatable kayaks can be safely used on rivers that lack heavy whitewater. What’s often forgotten, though, is that these kayaks are ideal boats for rivers that lack a strong current. On “stagnant rivers,” paddling is required to get anywhere. And that’s where these kayaks prove helpful. Just like paddling across lakes and ocean bays, a dedicated lake and flatwater inflatable kayak allows for easy paddling down stagnant or slow-current rivers. Since most rivers in the USA fall into the “stagnant” or “slow current” category and lack any sort of true rapids, lake and flatwater inflatable kayaks are often the ideal boats to use when floating these types of rivers. Any inflatable kayak works for paddling across lakes and other flatwater. However, few kayaks are specifically designed for speedy, efficient paddling across large lakes and flatwater. For this reason, shopping for a dedicated kayak for lake paddling is rather simple. And among the kayaks available for lake and flatwater paddling, the Sea Eagle FastTrack series of inflatable kayaks top the list. These kayaks contain all the “key characteristics” of a dedicated lake and flatwater inflatable kayak while being lightweight, portable, stable and very durable. For paddlers in search of an inflatable kayak designed for long lake and flatwater paddles, the FastTrack series kayaks are tough to beat. There are three kayaks that are part of the FastTrack series of kayaks. These are the 465, the 385, and the 385fta. The 465 and 385 differ only in their length/weight capacity/options available. The 385fta is a dedicated inflatable fishing kayak and comes tweaked with many “fishing friendly” features that anglers will enjoy and find very useful. Also contains a detachable skeg, further eliminating any yaw. Options include a rowing frame and a very small portable sail (called a QuickSail). Primary differences between the 465 and 385 FastTrack inflatable kayaks from Sea Eagle. If you always paddle solo on rivers with weaker rapids, go with the 385. The shorter length makes it easier to control. For solo paddlers, the 385 is also preferred if portages or frequent “land carries” are expected. Finally, if you want to install the swivel seat for fishing, you’ll also want to go with the 385. However, virtually everyone else will want the 465. For two paddlers, the extra room provides greater comfort. And the longer length and increased weight capacity make the 465 more versatile, since it easier to attach gear and because more gear can be hauled on long, overnight floats. In short, unless you’re a solo paddler and know for sure you’ll never have a second paddler in the boat, the 465 is the boat most paddlers will find that best meets their paddling needs. 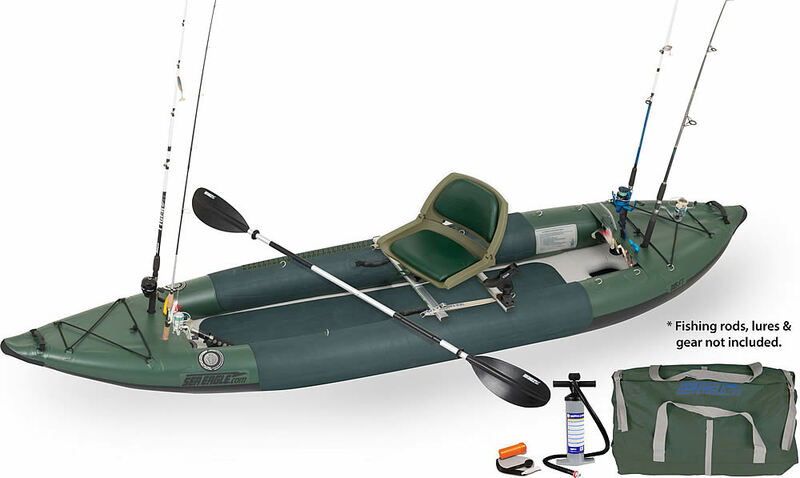 The 385fta is a dedicated inflatable fishing kayak built on the FastTrack hull. It’s ideal for anglers who seek a boat for fishing on lakes or relatively flat water. Sea Eagle 385 FastTrack series kayak. Designed for fishing on lakes with superb paddling characteristics. The kayak is meant for solo anglers, although you could easily fit a dog or a child in the boat with an adult paddler. So is an inflatable fishing kayak right for you? Read the inflatable fishing kayak article for more information if a dedicated fishing kayak is the right boat choice for your particular needs. But if you plan to fish on lakes and need a boat for one, the 385fta is an excellent choice for anglers who lack a motor or simply don’t want one. An optional trolling motor attachment is also available. Representing a huge leap in inflatable kayak technology, the Sea Eagle RazorLite series of kayaks are designed specifically for speed and ease of paddling on flatwater/lakes. So what makes the RazorLite so different from other inflatable kayaks? 100% Drop Stitch Construction – The only inflatable kayak made this way, it has no round pontoons. The lack of round pontoons is what allows this kayak to be so narrow. Super High Inflated Pressure of 10 psi – This makes the kayak extremely stiff, almost as stiff as a hard shell kayak. For pure lake and flatwater paddling, the RazorLite simply can’t be beat when it comes to ease of paddling, speed and straight tracking. These boats work well for both day and overnight trips. Built with the same tough fabric as found on other Sea Eagle boats, paddlers won’t have worries about leaks or tears. And the boat’s length, combined with the very high pressure used to inflate the boat, gives these boats a great weight capacity and thus making it simple to haul lots of gear. Because of the kayak’s length and very narrow widith, the RazorLite isn’t meant for new paddlers. Experienced paddlers will have few issues adjusting to the performance of the RazorLite. However, new paddlers will find it a challenge to adapt to the reduced stability of the RazorLite when compared to other inflatable kayaks. Moreover, the RazorLite kayaks aren’t meant for rivers with rapids over Class I. Paddling on rivers that lack strong currents and whitewater will pose no problems for the boat. However, the reduced stability and the overall design of the boat that promote perfectly straight tracking makes these boats unsuitable for any sort of whitewater. Thus, these are pure flatwater inflatable kayaks. Ultimately, the RazorLite represents the “next leap forward” in inflatable kayak technology. Nearly as easy to paddle across lakes and other flat water as hardshell kayaks, RazorLite kayaks provide performance like no other inflatable kayak can.